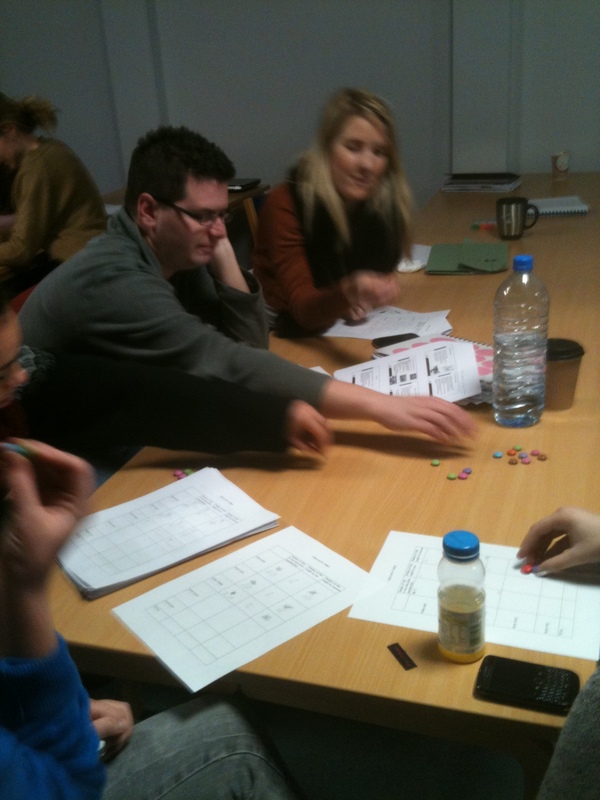 Fishing for smarties….the tragedy of the commons..
and these have in common? Well that is what my students found out today! It’s getting towards the end of semester. Exams are coming up, coursework’s been handed in and people are knackered! My students had an in -class exam today, followed by a lecture so I thought for the group-work bit of the class I’d do something a little more fun. The tragedy of the commons is a key bit of theory my students need to know, but it can be a little bit dry and the original paper is one you really have to wade through. In summary what it is basically talking about is situations where you have a resource (e.g. a lake full of fish) that people have access to. One researcher, Hardin proposed in 1968 that in such situations people will always use the resource for short term gains, NOT long term sustainability. By this I mean they will take as many fish as they can now, rather than leaving some in the lake to reproduce for next year. He proposed that users of these types of “open access resources” (i.e. resources anyone can access), tend not to establish rules about how to use the resource and as such it will end up being depleted – this is the tragedy of the commons. In contrast another group of researchers, Ostrom et al, in 1999, proposed that in situations like this the resource is never truly open access and that in fact there will be rules and regulations about who can use the resource and how. It recognises that one person’s actions will impact on other people’s. So in the lake example – you might have a village of fishermen and it may be that only the older men are permitted to fish, and only in certain months. These resources are in effect communally owned which is why the rules exist. So in order to get my students thinking about this, and to have some fun, we did a little bit of group work. 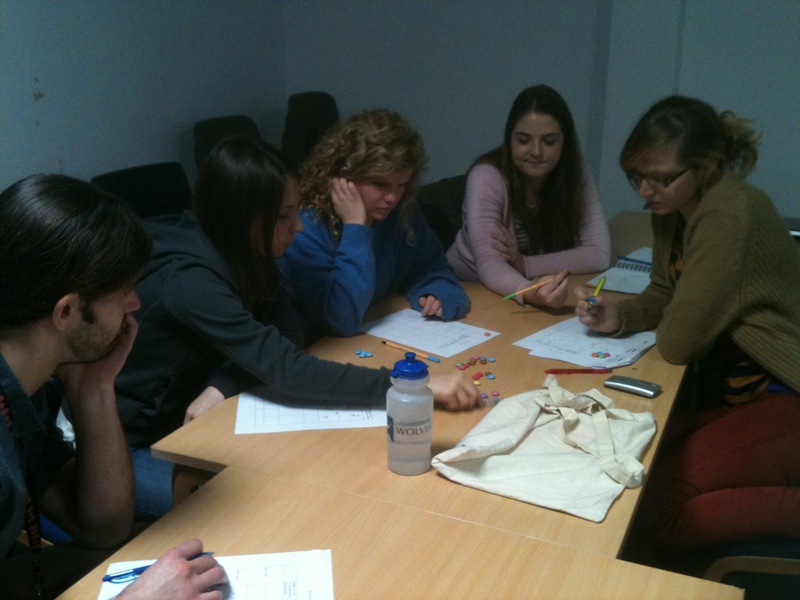 They were divided into groups of 4 or 5. Each group represents a village of fishermen. Each village has a lake within which are enough fish for 4 per person (or smarties in this case!). If they go fishing and catch only 1 fish their family will starve. If they catch 2 their family will have enough food to survive until next year. I however they take 3 or 4 fish they can sell the surplus for money. In the first round no one is allowed to communicate, so each “fisherman or woman” is acting indepently. The fishing season opens and in year one they are allowed to take 0 – 4 fish – it’s up to them how many they choose. At the end of the first year of fishing we see how many fish (smarties!) are left in the lake. 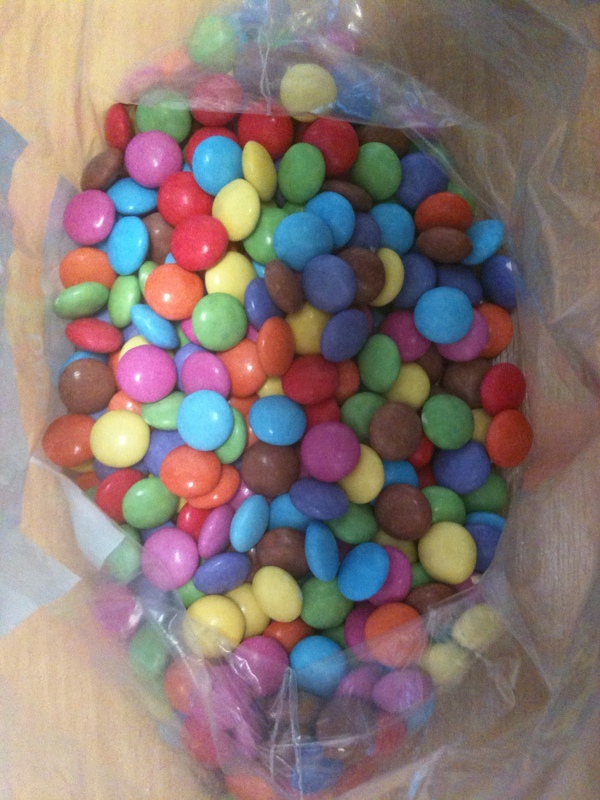 The fish then reproduce – so if there were 4 left they each reproduce resulting in 8 (hence the big bag of smarties!). Then the second year of fishing begins and once again they can take as many fish as they want to (up to 4). This continues year by year until there are no fish in the lake. Now the first time around, remember no one is allowed to talk to each other, so they’re all acting for themselves. What they very quickly find out is that the fish run out! In today’s example – one group only had 2 years fishing before the lake was left with no fish, the other groups only got 3 years. 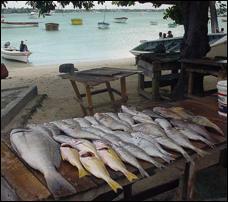 Meanwhile some fishermen had starved and others had grown fat on the profit of excess fish sales. This is an example of the tragedy of the commons – people tend to act more selfishly which results in not only depletion of the resource but also social inequalities. So in the next round they are now allowed to communicate and decide as a community how they want to operate the fishing and what people will be allowed to take. So the fishing starts again – back at year 1, but this time it takes a bit longer as everyone discusses how many fish to take…. After year 1 the fish reproduce again and we move to year 2 etc. Interestingly this time around everyone takes only 2 fish. So no one starves, and no one benefits from extra money from selling fish. As a result they can continue to fish well into year 5, 6, 7, etc (until I run out of smarties!) because the lake is now sustainable. They are taking enough fish to feed themselves but not so much that the populations is depleted. And of course there are no social inequalities – everyone is getting the same. So as a result all the villages keep on fishing, every year – well until the very last year.. when they know it’s the end and all dive in for the smarties! So this demonstrates Ostrom et al’s idea of common property resources. Everyone has access to the resource but they all have a stake in wanting that resource to be maintained. They’ve all seen the consequences of acting selfishly (they all starved after 3 years), so rules come in to play – only 2 fish can be taken by each person. This can be applied to a whole variety of conservation scenarios (and economic ones) and is a really important thing to consider when trying to manage resources and local people. The assumption that people will act altruistically when given the chance is generally wrong – most people tend to go for looking after themselves and their family in the here and now. 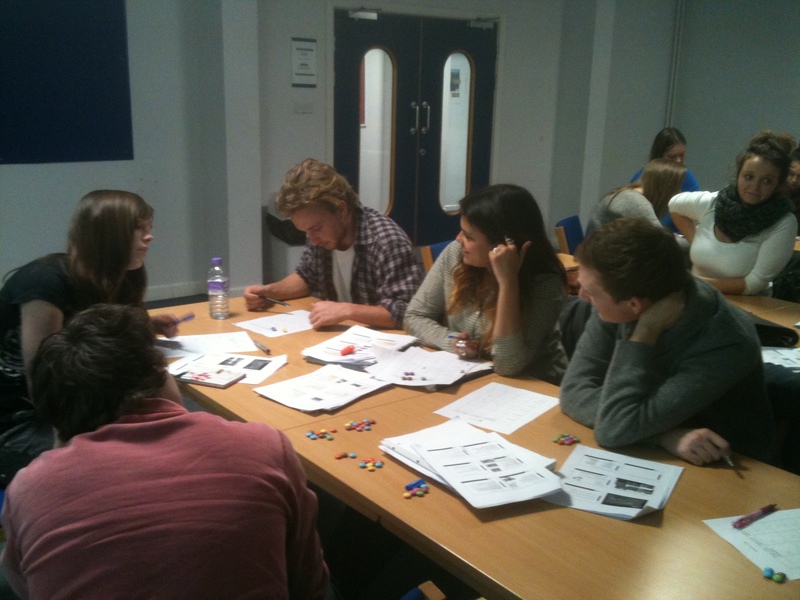 Anyway – something to think about and the students certainly seemed to enjoy it!